Open the feeder guard and pull up the paper support. If you are inserting a stack of paper, fan the sheets and tap the stack on a flat surface to even the edges. 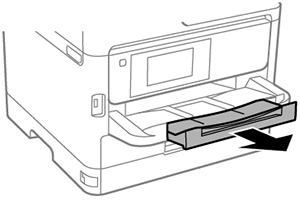 Insert paper, glossy or printable side up and short edge first, in the center of the slot. To prevent paper feeding problems, make sure you do not load paper above the arrow marks inside the edge guides. Select the size and type of paper you loaded on the LCD screen. Press the Paper Setting button and select the paper source, then select the size and type of paper you loaded. Select the size and type of paper you loaded in the Settings > General Settings > Printer Settings > Paper Source Settings > Paper Setup menu. 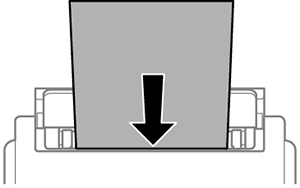 Do not load paper above the line under the arrow mark inside the edge guides. 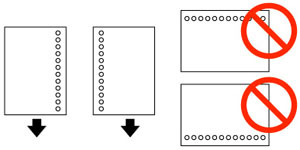 Do not load windowed envelopes or envelopes with adhesive surfaces on the flaps.